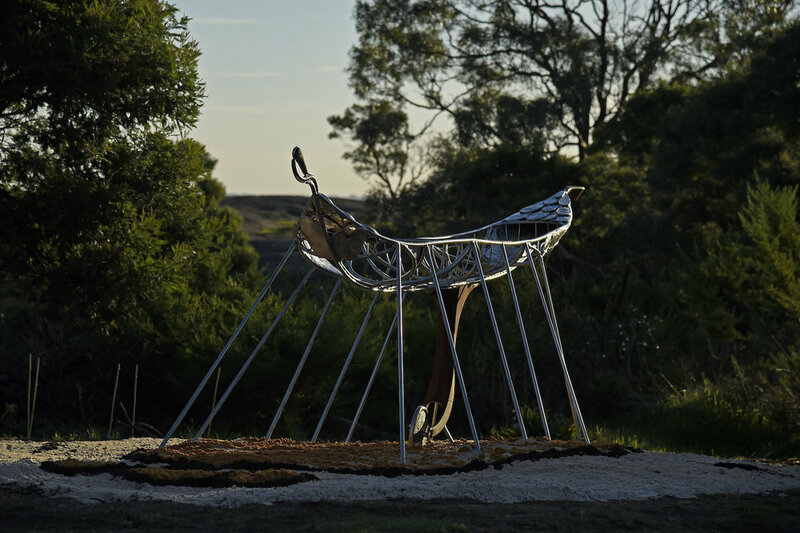 ART is central to Mountain to Mouth, from the commissioning of ‘Canoe’, the lead processional sculpture which is carried the entire length of the 80km walk arriving at its final destination at Barwon Heads for the ceremonial burning on 5 May, 2018. More information on our M~M 2018 Canoe Artists can be found here. 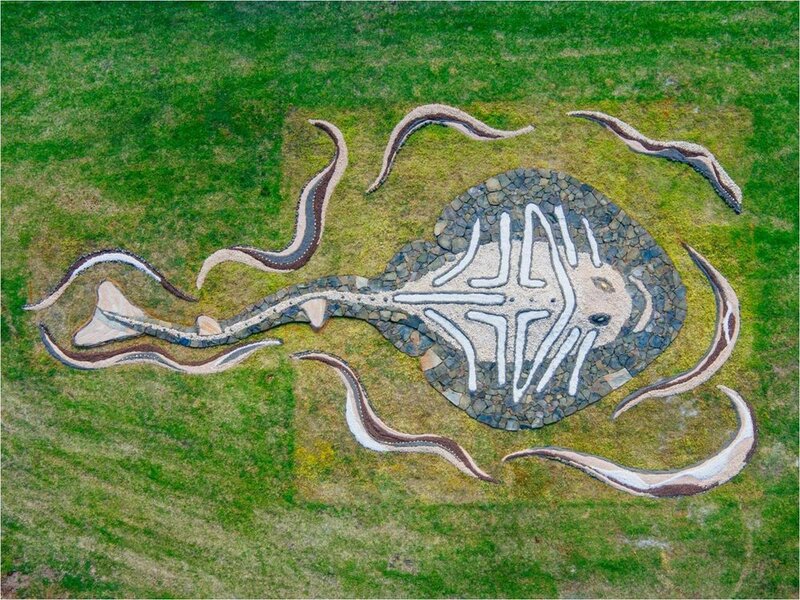 In 2017 remnants of ‘Canoe’ were commissioned as a major public artwork by artist Benjamin Gilbert, installed at Big Rock, You Yangs Regional Park, the starting point for the M~M extreme arts walk. Three Ceremonies mark pivotal moments in the 80km walk. The first Ceremony - Gathering of the Elders - pays respect to the land upon which we walk, to Wadawurrung Elders past and present, and to all our ancestors . This ceremony signifies that which sustains us, both as we journey along the contemporary songline, and as we move onwards in our lives. The second ceremony, Gathering of the City, signifies the end of the first day of the walk, as Canoe enters Johnstone Park to collide with Geelong After Dark. This ceremony celebrates that which nourishes us; our communities, our children our cultural practices and our gatherings. The final ceremony, Gathering of the Elements marks the completion of the 80km pilgrimage, and is a meditation upon that which heals us. In a ceremony of song, dance and fire Canoe is laden with votive offerings – or clooties - and then ceremonially set alight and sent out to sea from the mouth of the Barwon River. Walking Circles are commissioned ephemeral artworks by local artists responding to the environment and site in which they are installed. Walking Circles provide an opportunity for participants, walkers and visitors to rest at the M~M Stations and reflect on our connection to the unique land upon which we live, our many cultural heritages and to recognise with respect, those that have walked before us. District Coordinators are a key part of M~M team, coordinating communities and artists in the creation and installation of the Walking Circles and forming a communication network along the length of the 80km walk. M~M Song Cycle comprise a series of original compositions to be sung while walking stages on the contemporary songline. A choir moves and encourages walkers to sing along. Each stage of the contemporary songline has an original song composed that responds to the terrain, the country of that stage. M~M Song Cycle is currently being composed by Dr Jonathon Welch, Director of the School of Hard Knocks. This work progresses the M2M contemporary songline composed by Rod Gear, with songs Walk This Land (Tiffany Eckhardt and Dave Steel) and Carry Memory (Rose Bygrave) and includes 11 additional original songs making a suite of 13 songs in all. The Connecting Memory App houses Memory Bank, an online story bank of 40 short digital films and additional aural storytelling, songs and photography from locations along the M~M contemporary songline. Clooties: In Scots nomenclature, a "clootie" is a cloth or rag. Clooties are small strips of cloth used as votive offerings for healing that are tied on trees overhanging ‘Clootie Wells’ and are still found throughout the British Isles. Votive offerings containing messages written on cloths which are then burned (or buried, or dipped in water, or tied in the wind) are found in many cultures around the globe and are important but simple ceremonial activities that everyone can take part in. M~M2018 is taking up this tradition in 2018, asking all to participate by meditating on what they would most like to see healed (self, relationships, the planet etc.) and then expressing this on their clooties. Clooties remain anonymous and will be gathered up along Canoe’s 80km journey from Big Rock to Barwon Heads. They will then be ceremonially burned with canoe during the Gathering of the Elements. If you would like to make a clootie – for inclusion in this ceremony you can find blank clooties at each Songline station. Simply write on it what you feel needs healing, and then pop your clootie in the box provided.